CCS Interactive is the Inland Empire’s premier web development firm and digital marketing company (SEO). We have a proven track record of well over 20 years developing websites for small to medium-sized businesses. Our team consists of award-winning website designers, programmers, SEO, & internet marketing professionals. 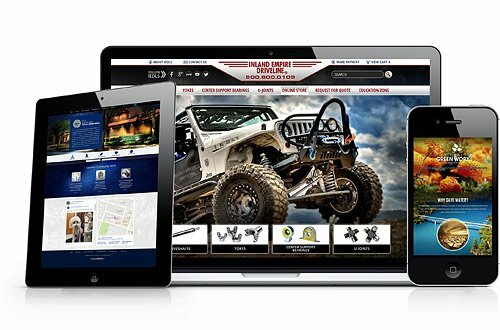 All website development is done in-house at our firm located in Ontario, California. We have been honored to be an integral partner and build lasting relationships with hundreds of businesses throughout the region. We enjoy nothing more than seeing our clients succeed. Contact Us to see how we can help you. CCS Interactive prides itself in it's commitment to excellent customer service, superior design, and customer empowerment. If you have any questions regarding any of our services, call 909.981.6331. Contact Us Today / Request an Appointment! No two clients are alike. Every project we take on is custom-built to meet your specific requirements, objectives, and goals. From design to programming, every website we develop is totally unique. You will never encounter another website that looks identical to your site. Our extensive graphic design and programming skills along with our unique understanding of our client’s needs allow us the ability to create websites that suit your business. All our websites contain an intuitive "back-end" management system that will let you control the content anywhere, anytime. View our portfolio to see just how well we capture the essence of each client’s needs while still providing that “wow factor” needed to make a positive impact. We offer high-end designs at competitive prices! Working within your budget to give you the website you deserve while not sacrificing quality is our specialty! There are plenty of cookie-cutter, template based websites out there. Your website should be a reflection of your company, showcasing the unique features and services that you offer. Do you want to blend in, or stand out and increase your Return On Investment (ROI)? Since 1996, we have been developing eye-catching and award-winning websites for small business and large corporations alike. We pride ourselves on being different. We won’t try to upsell or mislead you or offer empty promises. We put you in control of your website. Our content management system is robust yet extremely easy to use. If you can write an email you can update your website. Not every business needs a new website or a website redesign, but every business does need website maintenance from time to time. We offer one-time, piece work, and contract services for digital photo editing, logo creation, website updates, search engine optimization services, and social media. Some of our areas of design expertise include cities and water districts, medical websites, animal hospitals, auto websites, property management & HOA websites to name a few. We offer designs that follow responsive web design and mobile-friendly standards to ensure that your website is viewable on as many devices as possible. Scroll down to see some of our latest projects and read our case studies to learn how CCS Interactive can help improve your business! In addition to website services, we are the only web design company that also offers live, hands-on administrative software training in Microsoft Office software such as Excel, Word and more through our education division. We routinely provide training for college faculty, utility companies, and supermarket chains along with individual and corporate computer training ranging from introductory to advanced levels across California. Visit our education division, California Computer Schools to learn how we can help you improve your work productivity by training your staff to become more efficient with their computer skills. Located in the city of Ontario, CCS Interactive offers website design, consulting services, internet marketing, Local SEO, custom logo design, website hosting, and mobile website design to the surrounding areas of the Inland Empire such as Rancho Cucamonga, Ontario, San Bernardino, Norco, Corona, Upland, Eastvale, Fontana, Redlands, Riverside and the greater Orange County and Los Angeles area. CCS Interactive is determined to provide cutting-edge internet marketing solutions and affordable web designs to all of our clients. Enhance your web presence and Contact Us today! Copyright © 2017 by CCS Interactive All Rights Reserved.